Three boats crammed with artists made sedate progress down Manda Channel for the hour-long journey to Matondoni. Lamu seafront slowly disappeared behind us and buildings gave way to the thick mangroves as we slowly chugged along. A small ngalawa canoe appeared as the usual scenic sight, until we noticed the herd of cows tied alongside the boat. Heads bobbing in the water like bovine buoys, the cows gasped for breath in the waves as they made the crossing from the mainland to the island. Lulled into a stupor by the soporific drone of the engine, the initial excitement of our boat trip began to dissipate. Eventually the solid concrete pillars of the jetty came into sight, and we caught strains of music wafting in the breeze and figures waving their arms and dancing. The Matondoni villagers had come out in full force to welcome us. Woven palm frond archways, decorated with bunches of bougainvillea flowers, festooned our pathway and a band beating out music from improvised instruments serenaded us into the main square. 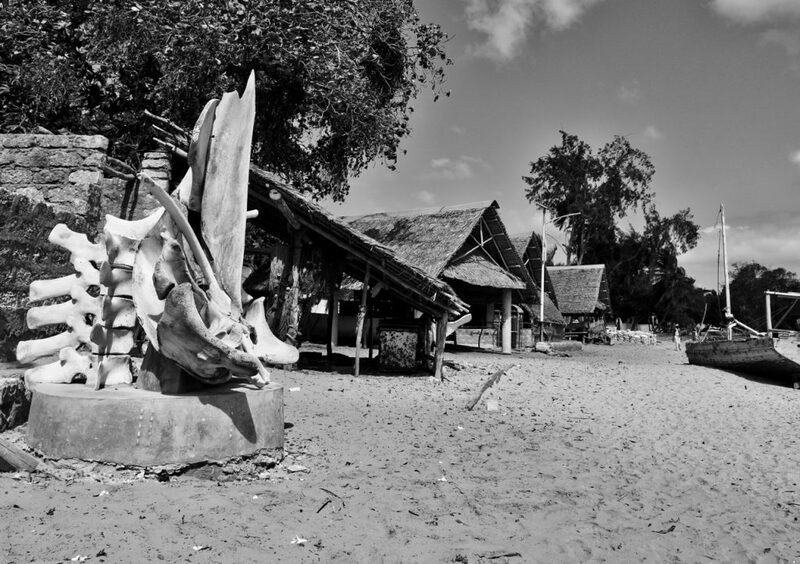 It was a moving experience – intensified by the greyness and general poverty of the village. Matondoni was once renowned as the centre of the dhow-building industry. Fishing boats and ocean-worthy Jahazi dhows were constructed on the beach from giant mahogany beams and mangrove poles. Vestiges of this old business remained – the skeleton of a dhow being repaired at the water’s edge, the blacksmith hammering out iron nails in his rudimentary forge, pumping bellows fashioned from paper sacks. 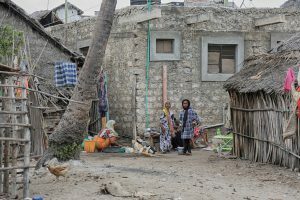 For our first time visitors, it was an eye-opening experience and many of them expressed their despair at seeing scantily clad children crawling among the rubbish in the grimy sand surrounded by flea-bitten dogs and skeletal cats. However, the poverty seemed to recede against the welcome smiles and beaming faces. The beauty of the girls in their colourful headscarves seemed more vibrant against the bleak background and they were soon sitting patiently for Rob Houdijk and Marjolein Menke. In the back of the village we were taken to meet an ancient lady with unseeing milky eyes whose hands nimbly wove dried palm frond strips. Inside the blackened walls of her house, an old vidaka still decorated the room. It was a tangible reminder of the antiquity and former wealth of the village. The painters were soon hard at work creating their interpretations of the wooden donkey pens, makuti-roofed shacks and scraps of metal serving as doors. When we straggled back to the square, an impromptu market selling woven bags and hats had been set up. The band struck up again – the homemade trumpet sounding like a snake charmer’s tune, accompanied by drums made out of yellow jerry cans and lids beaten with lengths of old hosepipe. We were handed coconut water, served in the original husk and chunks of sticky mango. Spontaneous dancing broke out with the painters and villagers caught up in the moment. It was a moving end to a very unusual visit. Visiting a familiar place with newcomers is always stimulating – but seeing it through the eyes of artists gives a fresh new perspective. 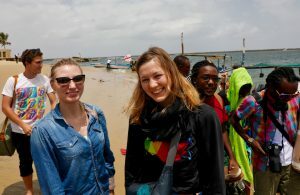 And so it seemed on our first visit to Lamu Town. As we disembarked at the jetty, herded by Malfreza and our ‘minders’, the grubby walls and general chaos of the town melted away. Our nine ‘plein air’ artists soaked up the romance of the ancient streets and absorbed the colours and atmosphere of the fruit market. On a quick tour of the old town, having admired the elegant old houses linked by covered bridges or ‘wikia’, we stopped outside the door where Mwana Kupona had written her famous poem ‘Utendi’ in the 19th Century. We had a brief visit inside the classic old building that houses Wildebeeste Workshops and the artist, Yony Waite’s studio. 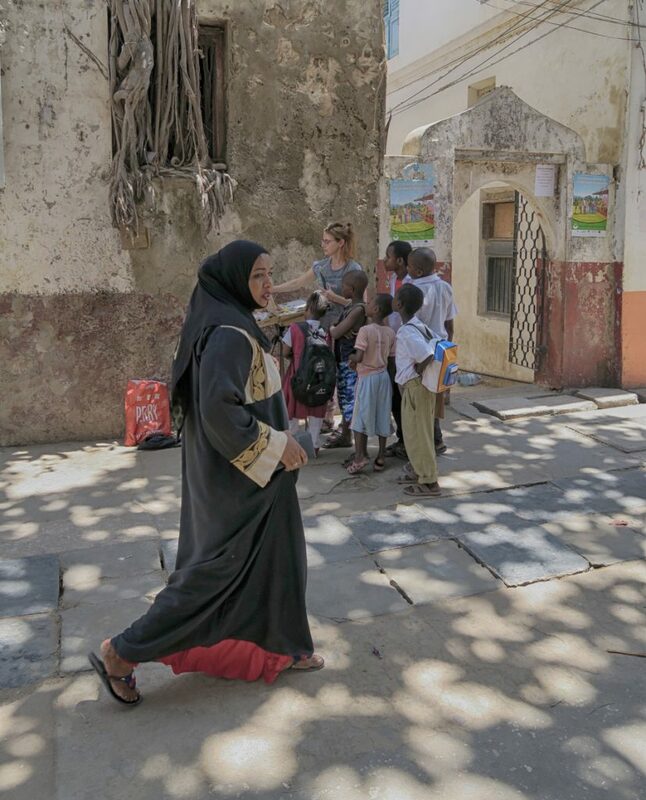 Friday is mosque day and always a good time to visit Lamu: the men are dressed in their flowing white ‘kanzus’ and ‘kofias’, the boys as miniature replicas of the men and the little girls in their best shiny frocks (the women are clad in black bui buis as usual). The artists gravitated back to old Indian Almond tree at Mkunguni Square outside the Fort and were soon setting up easels. Before long they had attracted crowds of onlookers, carefully watching every brushstroke. 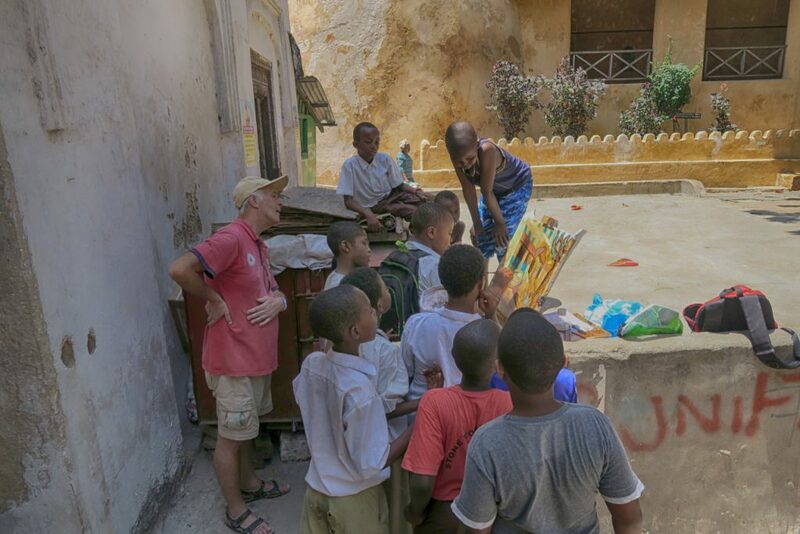 The children lingered the longest with Robin Akkerman instructing an impromptu art class. 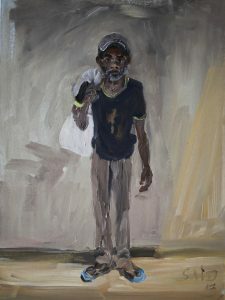 They clamoured to help him with his painting – demanding more paint for their brushes. A teacher of art, he was intrigued by their request for the brighter colours and soon the other artists were donating their unfinished palettes. On the other side of the square, Machtelt Ijdo was surrounded by her own fan club. Finished paintings were stacked against the old cannon guarding the Fort and the square soon resembled an open air art gallery. 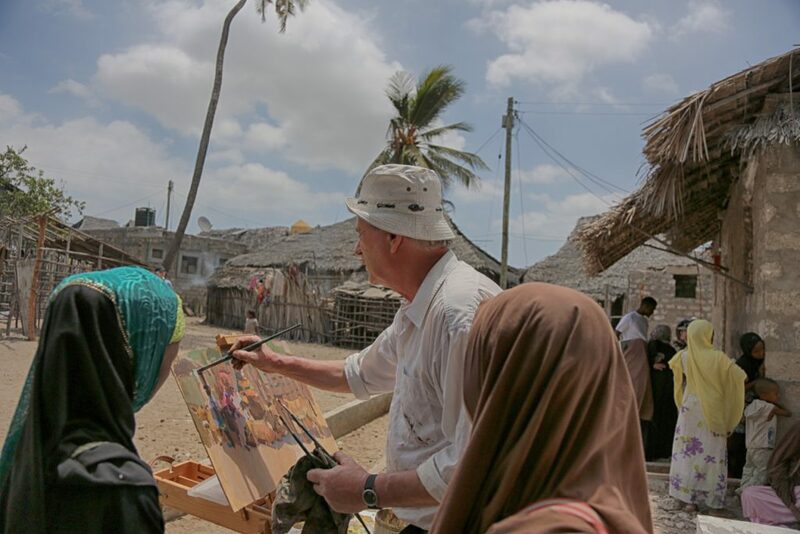 Even the Governor of Lamu stopped off with his retinue to see the work and meet the artists. Most of the painters had chosen to paint near the square but with totally different styles, and no two pictures were alike. Pavel Kratochvil was more adventurous and had chosen a view of the market. His vibrant interpretation not only captured the colours but also the atmosphere. Watching the artists at work gives one a new appreciation of the term ‘plein air’ and what it entails. 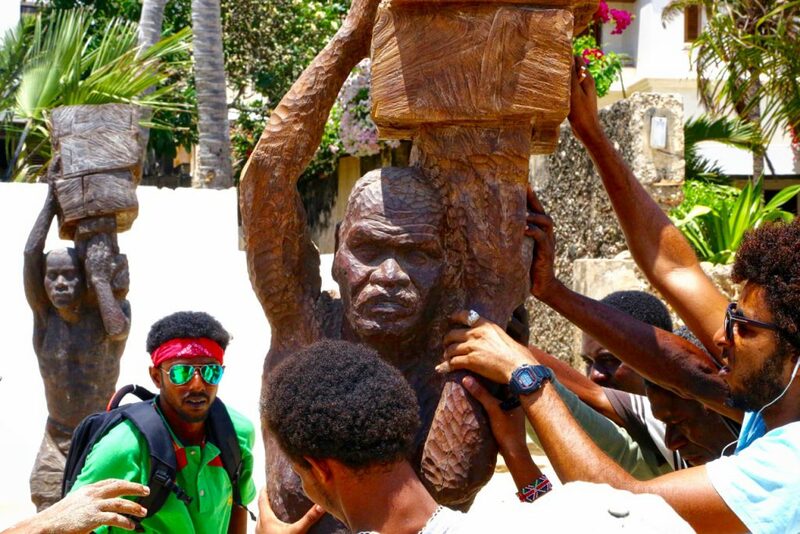 These artists probably have never experienced the excitement and interest generated by the local Lamuans or the challenges of painting in a sticky hot market, shoved and jostled by shoppers and stall keepers. 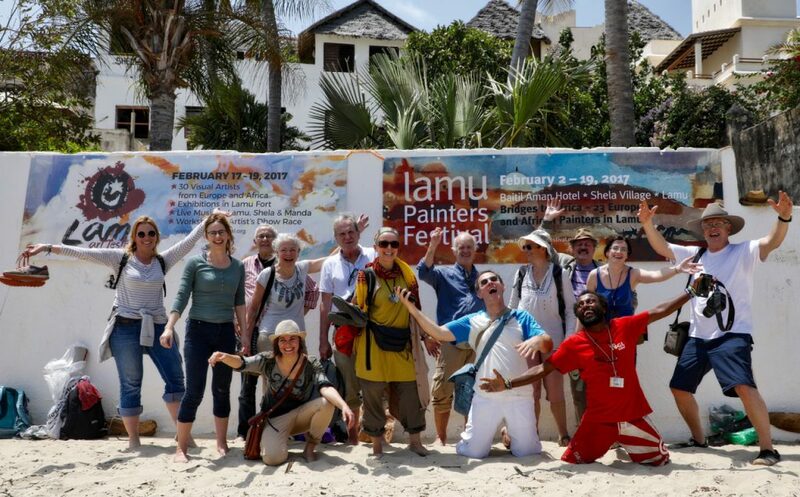 They took these new challenges in their stride and the paintings brought back to Baitil Aman, for cataloguing, all captured that essence that makes Lamu Town so special. 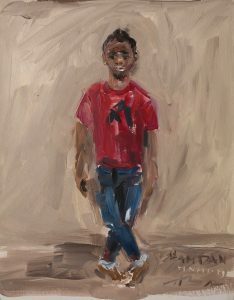 The first batch of paintings has started to dribble into Baitil Aman’s inner gallery. No painting is alike and the ‘plein air’ artists’ palettes range in colour – some are bright and bold, others muted and delicate. Still wet, they are stacked up against the mottled walls of this beautiful old palace, the sign of a productive day. The first day has been dedicated to painting around the village and on the seafront. Walking down the beach at midday, it seemed that every nook and hideaway, heralded by the scent of turpentine, contained an easel and an artist: brushes flicking away, capturing that precise moment of light and atmosphere. The Shela villagers stroll about, intrigued by this disruption to their daily routine. Like serious art critics, they inspect each work in progress. Some are bemused by the whole affair but others delight in recognising familiar landmarks depicted with a simple daub of paint. The donkeys and crowds of cats, on the other hand, are oblivious to the painting invasion as they forage in the tidal debris. Not all the painters are painting in the open. Some of the regulars, such as Svetlana Tiourina, have embarked on massive projects of their own. 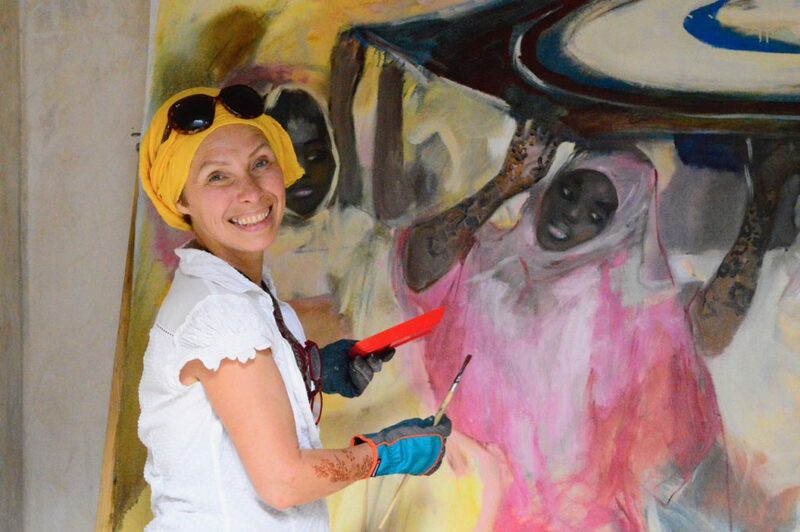 Svetlana has turned an elegant arched alcove off the central Baitil Aman courtyard into her impromptu studio, dominated by her giant canvas. 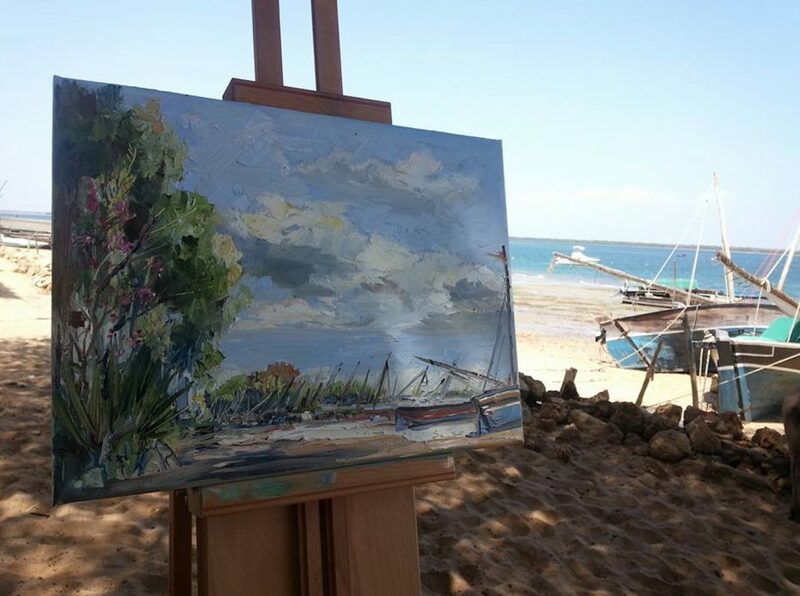 On the surface, the painting portrays an event in the four-day Lamu wedding ceremony. It depicts the moment when the virginal bride is escorted by her female relatives and friends to be cleansed and anointed in preparation for her new life. Svetlana, however, has imbued it with symbolism which is slowly appearing on the canvas. 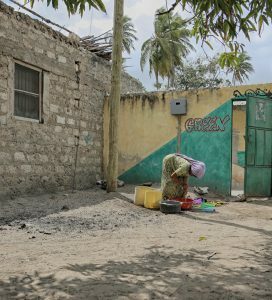 Svetlana Tiourina, Lamu Daily Life Series. 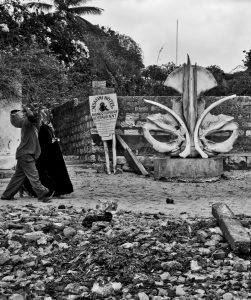 The Kenyan artists including Peter Ngugi, James Njoroge and and Nduta Kariuki walked all the way from Shela to Anidan Orphanage in Lamu. 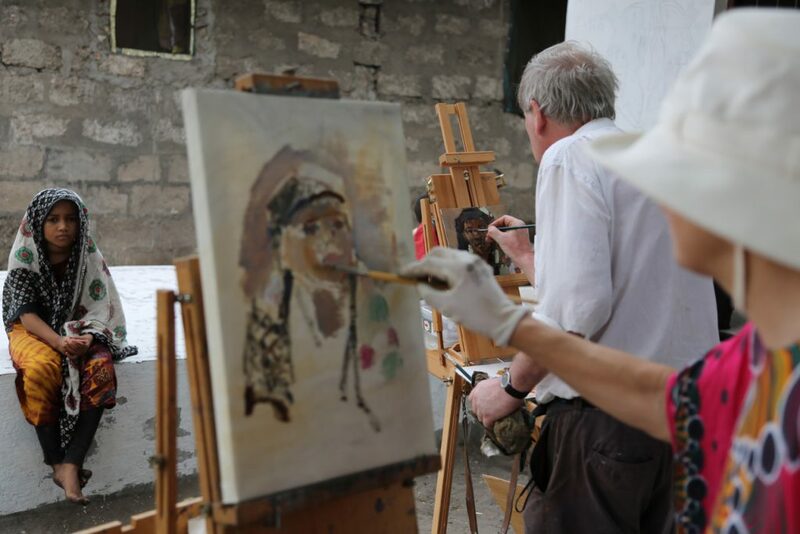 Nduta identified potential models for her series of Lamu portraits and the others are starting their projects. 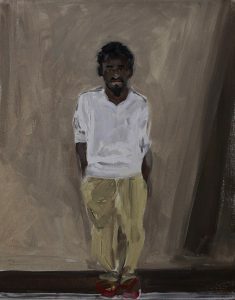 There are almost 40 painters in this year’s festival from Russia, Germany, Netherlands, UK and Kenya. 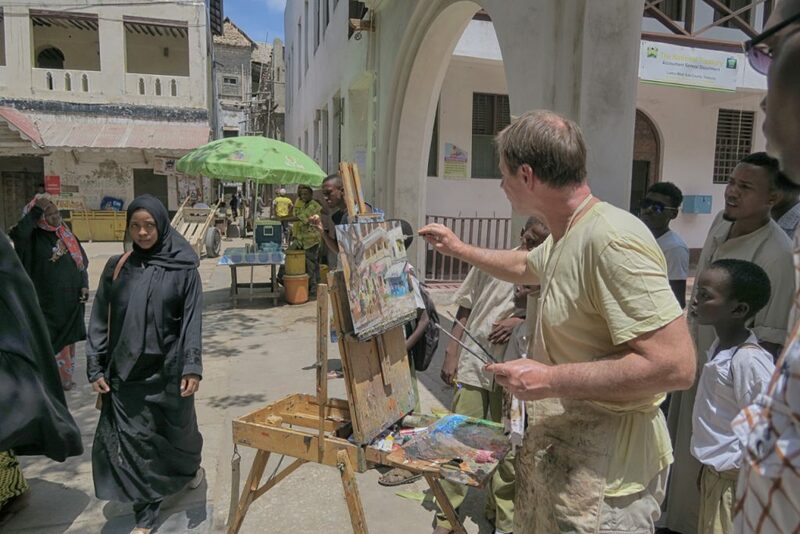 Language is a bit of a barrier but this first crop of paintings say much more about the artists’ delight in being on Lamu Island than words ever could. 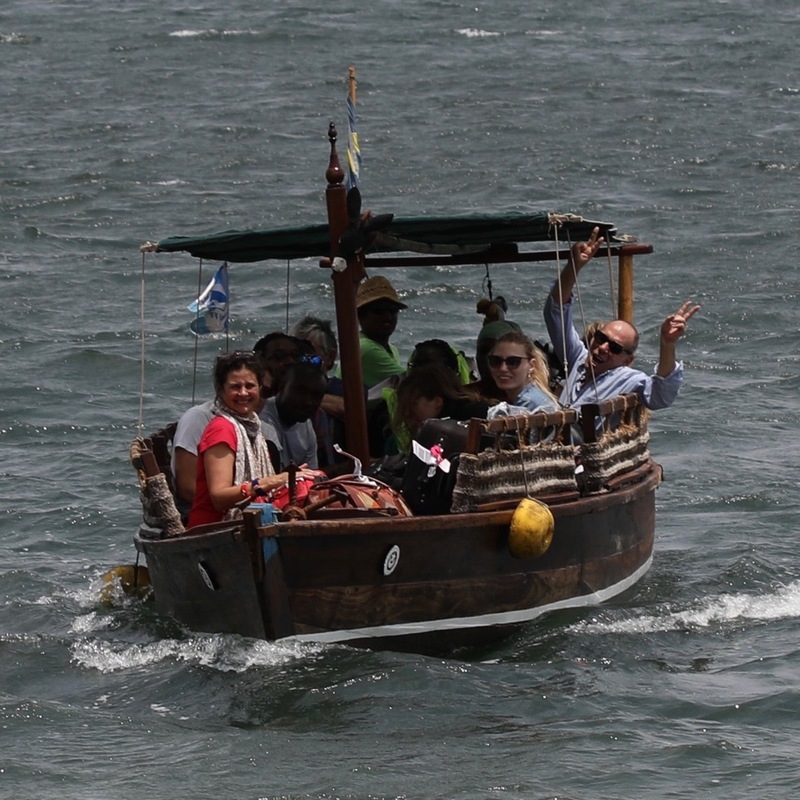 Few locations in the world for art lovers only to arrive by water taxi: from Nairobi Peter Ngugi, Nadia Wanjiru, Waweru Gichui, Nduta Kariuki, Maina Boniface, Dale Webster, Julia Seth Smith, Camilla McConnell, Coltrane Mc Dowell, Paul Taylor, from Russia Olga Peshkova, Maria Kolyvanova. Even for the seasoned travellers there was a palpable air of excitement as we checked in to the airport. In our party of ‘Nairobi-ites’ were two young Russian artists, Olga and Maria, who had been crossing time zones for two days. Leaving their home in the Urals where the temperature was a mild -20c, they had flown to Nairobi via Moscow and Doha before overnighting in Karen. Tired and discombobulated from leaving the familiar, one could only imagine their first impressions of arriving in such a paradise as we all piled into ‘Lady Gaga’ for the boat journey across the channel to Shela. 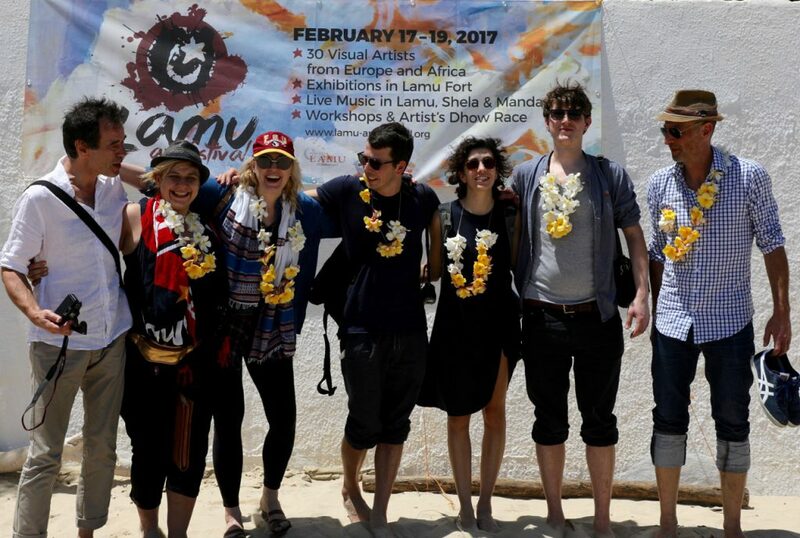 The ‘Kenyan Contingent’ were the last of the ‘arrivals’ for the Lamu Art Festival. Met on the beach by Herbert Menzer and his team, we were swiftly dispatched to our various lodgings in Jannatan Hotel and Baitil Aman – the central rendezvous for the resident painters. The afternoon’s activities started with the grand tour of the village. Bemused by the maze of alleyways, dead-ends, and seemingly empty graveyards, the newcomers followed blindly behind Herbert as he pointed out the various sites of interest. We quickly learnt who had right of way as a cavalcade of donkeys thundered past us, followed by lines of men shouldering heavy wooden beams. We peered through the archway into the courtyard of Fatuma’s Tower, enchanted by the tree-tangled ruins and eclectic buildings. The Wa Deule Mosque ruins, in the shadow of the dunes, have lost a little of their rustic charm with the building of the new madrassa boarding school but the crumbling vidaka wall still conjures up the spirit of Shela’s past grandeur. 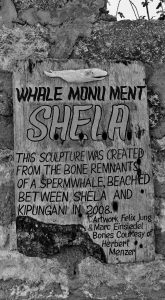 On the beach, the newly constructed Whale Monument by Felix Jung and Marc Einsiedel stands starkly in the sand. 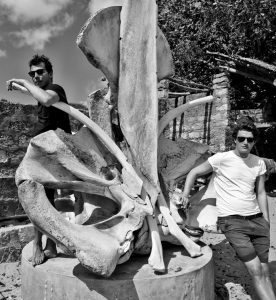 The bones are the remains of the large sperm whale that was stranded on the beach nearly a decade ago and have been carefully pieced together to celebrate the monumentality of these magnificent mammals. Stopping off at Joachim Sauter’s studio in the middle of a construction site, we popped in to see the progress on his powerful wooden sculptures. Photos do not do justice to his interpretation of the stone carriers at Maweni. The oversized scale and pathos in the details of these five men – their shoulders straining under the weight of the blocks of stone is a spine-tingling experience. In the building-debris strewn courtyard, Eveline van de Griend is using traditional coral block and neru as her medium to sculpt a head. As evening fell, the alleyway outside Baitil Aman thronged with painters – spruced and cleaned up from a day painting plein air. The hotel’s dining area under a leafy loggia was crowded with the full complement of artists now in residence. Under the ancient vidaka niches, we queued for the buffet – fish cooked in fragrant banana leaf, chapatis, rice and a chilli infused mango salad – prepared by Herbert’s team of cooks. It was a perfect meal to end the official first day of the painter’s festival. Eveline van de Griend, head of coral block, lime and nero. 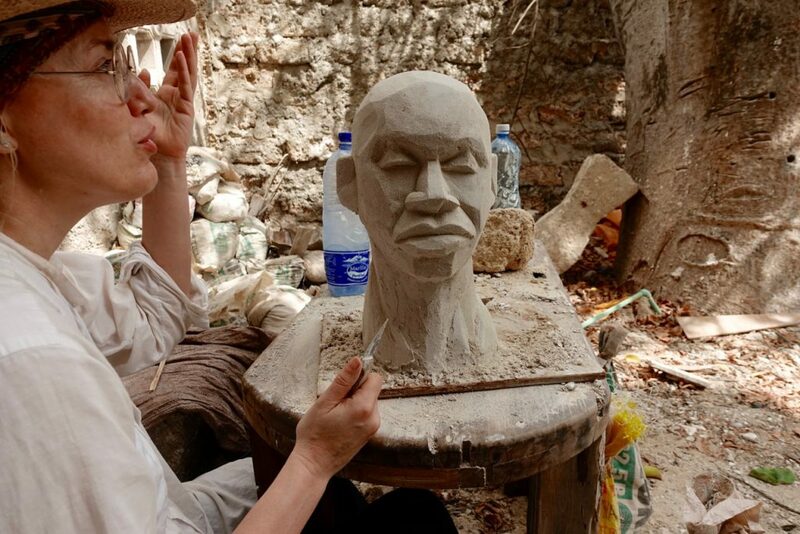 Sculptor Joachim Sauter is back in Lamu to continue the Maweni coral stone carriers series. Thrilling arrival of 13 artists from Netherlands, Germany & Russia at Peponi beach today: Sonja Brussen, Machtelt Ijdo, Ernst Dingemans, Marjolein Menke, Irina Melikhova, Rob Houdijk, Sibylle Bross, Robin Akkerman, Claire Bianchi, Valentin Skachkov, Mister Banana, Tatiana Lushnikova, Frans Bianchi (from left). 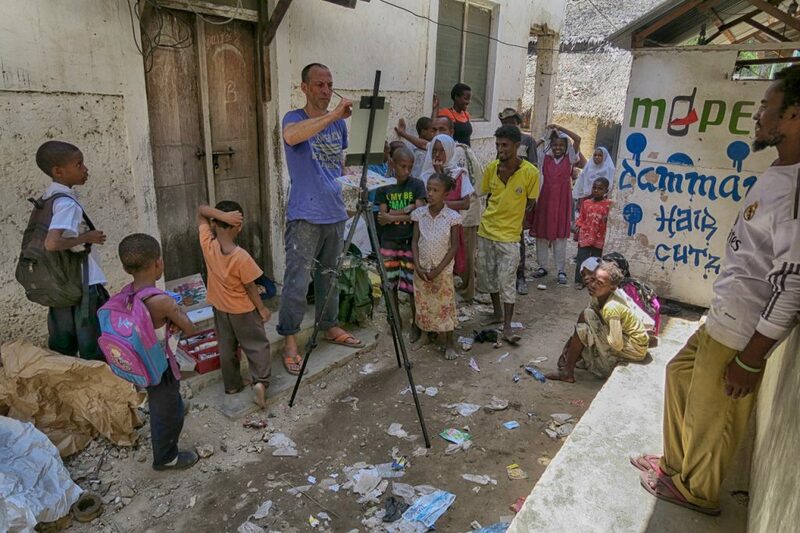 Hartmut Beier at work in Lamu town lanes. From left: Roland Klemp, Ekaterina Mitichkina, Eveline van der Griend, Marc Einsiedel, Juliana Oliveira, Felix Jung, Hartmut Beier. This is how you get to Lamu: first arrivals for artist in residency workshop to prepare for the Lamu Art Festival 2017. With Salim Captain Hook.